F45 Training puts fitness fans through a 45-minute session of high-intensity interval training. LINCOLN PARK — The latest fitness craze from Down Under is coming to Chicago. F45 Training, a routine based on 45-minute sessions of high-intensity interval training, opens later this month or early August at 1001 W. Diversey Parkway. It boasts of being "the world’s fastest-growing functional training network" and has opened more than 800 studios in 26 countries since being developed in Australia in 2014. 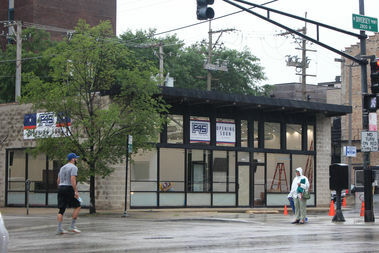 "It just exploded on the international scene, and it's come to the United States recently," said Pat Cunningham, studio owner of F45 Training Lincoln Park North, who also owns the eight Chicago Athletic Clubs, including the Lincoln Park Athletic Club next door at 1019 W. Diversey. F45 Training will be at the corner of Diversey and Sheffield. Cunningham said he plans to keep pace with the rapid growth, with 17 Chicago-area clubs planned, starting in Lincoln Park and in Evanston. F45 claims its customers burn 750 calories in a session based on a mixture of strength training and cardiovascular exercise, and fitness director Sarah Ruhl is a believer. "I've been doing fitness classes 25 years, and it's not like anything I've ever experienced," Ruhl said. "It's fast-paced, it's interesting, it's challenging." The team-based workouts, set to popular music and with a maximum class size of 27, are guided by a pair of trainers, but the key is 27 different training systems and pieces of equipment stretched out over the more than 3,000 square feet in the Lincoln Park location. "It's a catalog of 5,000 different exercises, so no workout will ever be the same," Ruhl said. "It's a great workout. The technology supersedes anything we've seen." The latest fitness research has touted the effectiveness of high-intensity workouts, and Cunningham said that's where the "buzz" is in the industry right now. But Cunningham and Ruhl insisted it could be done daily, and that it suits "any level of participant." They said that when they first saw it in La Jolla, Calif., 20-year-olds were doing it alongside 65- and 70-year-olds. Cunningham said memberships would be $179 a month for those who get in early at the club's opening, with plans to set a normal rate of $225 a month.